I gave it a try the same evening and it came out so well… We’re big time poori lovers, no matter if it’s for breakfast, brunch, lunch, dinner :D And so quite obviously, we loved this one too. And make sure you don’t use wheat flour to replace maida here ;) It’s not the authentic way!!! As I said before, some things are better kept original only… I don’t find substitutes everytime :P lol…. You must try out this simple & authentic version of Luchi!!! Take maida, ghee and salt in a bowl and mix them well together. Once it starts forming crumbles, knead a soft dough using water as required. Once you complete kneading, cover with a damp cloth to rest for half hour. 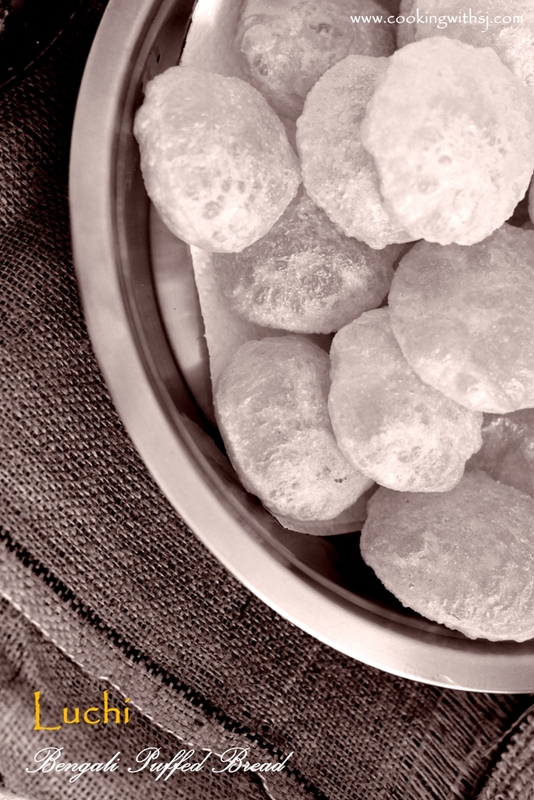 Divide the dough in small balls and roll them out to make around medium sized pooris. Heat ghee/oil (preferably ghee) and deep-fry these luchis on low heat. Make sure it puffs up on both the sides. You won’t get the golden brown color as only maida is used. Drain it on kitchen towel and serve hot!